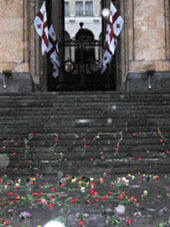 Georgians observed a day of national unity yesterday, bringing flowers to the steps of parliament in remembrance of the killing of Georgian pro-independence demonstrators 19 years ago in Tbilisi. That day, a tragic punctuation to what Georgians remember as the ‘bloody week,’ reverberated not only within Georgia but throughout the Soviet Union. Thousands of Georgians were rallying on central Rustaveli Avenue in the campaign for independence when on April 9, 1989, the Soviet army brutally dispersed the crowd with nerve gas and metal spades. 21 are thought to have been killed, with many more injured. The crackdown radicalized Georgia’s nationalist movement and lent impetus to campaigns in other Soviet republics, then at the brink of their own independence. Two years later, nationalist movement leader Zviad Gamsakhurdia declared Georgia an independent country on April 9, 1991. A long-time Gamsakhurdia ally said Georgia’s independence was a direct result of the events of April 9. “April 9 brought independence not only to Georgia, but to Eastern Europe. After the April 9 tragedy, many countries had velvet revolutions and the Soviet Union didn’t dare risk confrontation,” said Akaki Asatiani, leader of the Traditionalists and a campaigner in the independence movement. He compared today’s opposition coalition—which his electoral bloc is competing against in the May parliamentary elections—to the old nationalist movement. Georgian ex-president Eduard Shevardnadze, once the Soviet foreign minister, told the newspaper Akhali Taoba that the Georgian leadership of the time made a major mistake on April 9. “If [politburo leaders] had met with rally participants, if they had said they were supporting Georgian independence, they would lose their position but would enter Georgian history as heroes,” he said. According to Shevardnadze, Moscow began a criminal case, questioning many local officials including Shevardnadze himself, but no one was prosecuted. “If an army uses weapons, it doesn’t happen without a leader’s permission,” Shevardnadze said, adding that the same thing happened on November 7, 2007, when the Saakashvili administration violently clamped down on anti-government protestors. As part of the day of remembrance yesterday, the ruling party launched a blood donation campaign. Tbilisi’s deputy mayor and local celebrities visited Tbilisi State Clinic to donate blood. Giorgi Targamadze, a former high-profile television anchor now helming the Christian Democratic Party, visited the April 9 memorial in front of parliament and suggested moving the country’s official independence day to April 9, now a state holiday. Georgian independence is celebrated on May 26, when in 1918 the short-lived Democratic Republic of Georgia declared independence. Some politicians and former participants in the independence movement of the 1980s feel April 9 should be celebrated as an independence day, in part to enshrine the campaign’s contribution to founding the modern Georgian state.